I am horribly saddened to hear of Elizabeth’s death. We worked together in about 1975. That’s actually me in the shrubbery costume in the picture above, waving my leafy tentacles made of old hoses and garbage bags painted green. It’s best not to ask why I was on set that day, dears. Let’s just say that the mid seventies were an interesting time in the world of international espionage. She was a fine person and a fine actress and she will be missed. 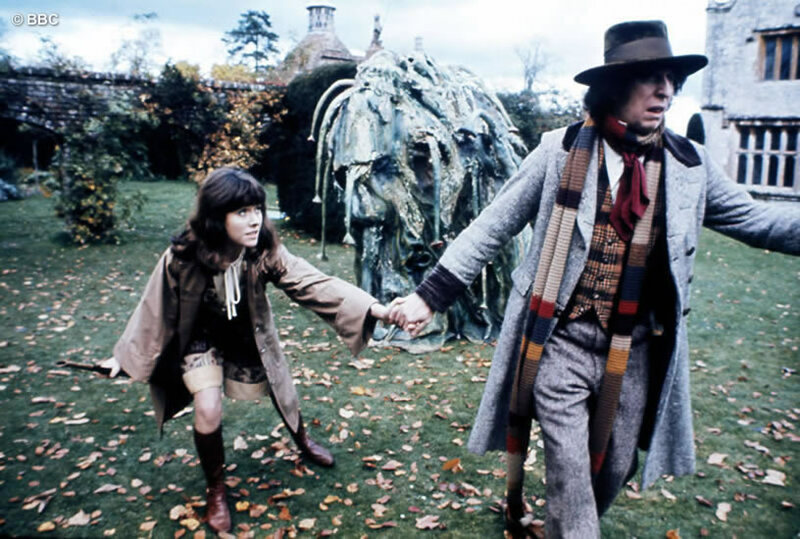 Alas, Sarah Jane has gone to that big TARDIS in the sky. She certainly sent a thrill up my then-13-year-old leg when I first started watching “Doctor Who” back in the early 1980s, which was probably the first indication of my attraction to older women. I always considered it a pity that the Doctor didn’t accidentally drop her off in Chicago instead of Not-South Croydon. Safe journey Elisabeth (Sarah Jane). May your memory be for a blessing. So sad and so heartbroken when I heard of Elizabeth Sladen’s passing. Much too soon. Only 63, what a shame. I would have liked to see more of “The Sarah Jane Adventures”.